This is it! The revolutionary new P-Werks SRT-4 Active Downpipe System! 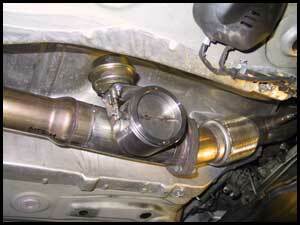 The first and only completely bolt-on SRT-4 active downpipe system on the market! The system transforms your car into a wolf in sheeps clothing! During normal driving the factory cat-back exhaust system is being used and exhaust noise is kept at near factory levels. As soon as you go into boost an actuator opens a 3" butterfly valve and your catless 3" exhaust exits out of the passenger side undercar. No switches to open dumps. Fully automatic! Perfect for daily driven SRT-4s that don't want to attract un-needed attention from you know who! The system includes a 3" catless downpipe, active butterfly valve, instruction manual and all parts needed for a 100% bolt on installation!